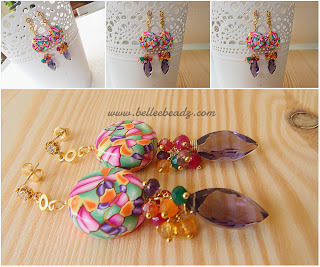 These pretty coin shape polymer clay beads remind me of Joseph's colourful coat. Busy lizzy is a species of the genus impatiens and comes in a variety of colours too. Basically this is just a happy little pair of earrings. A marquis shape purple quartz brio, green onyx, carnellian, purple amethyst and lemon quartz rondelles add to the festive feel of this lovely pair.